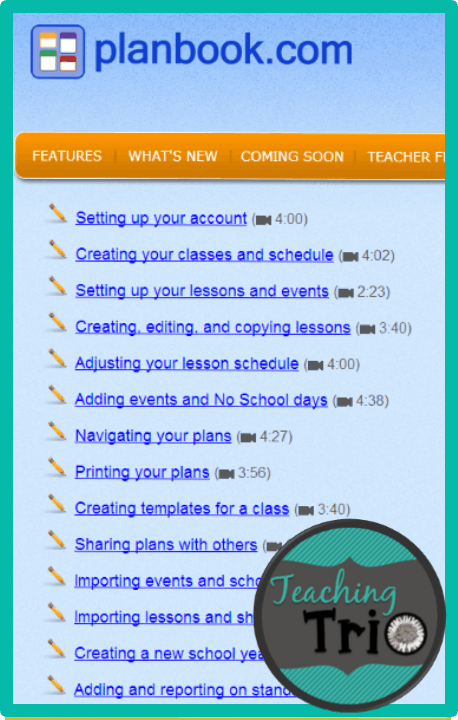 A little over a year ago, I tried something new…online lesson planning. Like most of you, I was used to writing down plans in a spiral bound lesson plan book. 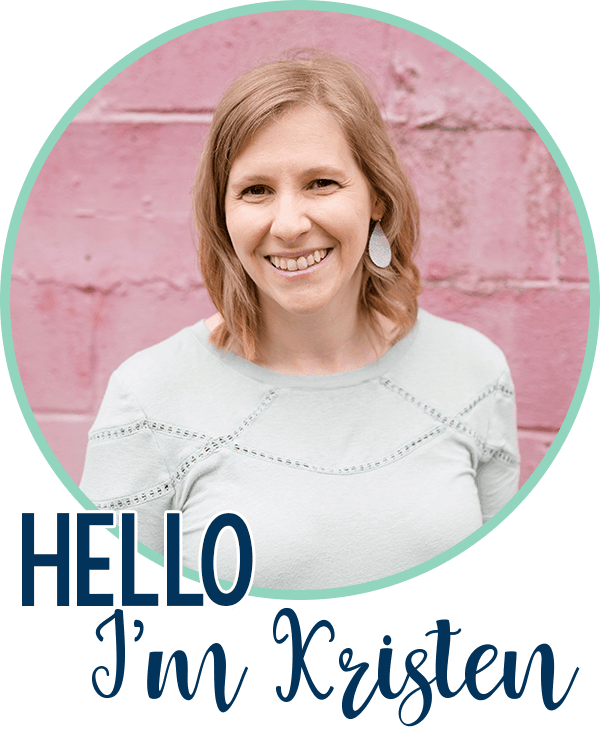 While that method is obviously time-tested, I’ve found that online planning offers some pretty impressive benefits when compared with the old standby. In fact, all three members of the Teaching Trio are loyal Planbook.com users! 1. Color code classes any way you want. Just because you skip the paper planner doesn’t mean your plans can’t be cute! Mine is a rainbow! 3. View & copy last year’s plans. Talk about a time saver! Obviously, I’m not copying an entire year over (although it’s possible), but I do sometimes copy one unit that went really well. I love that I can use it to find attachments easier than hunting through all of my various drives too! 4. Templates save precious planning time. Enter all of those things you do over and over once, and never do it again! See my enrichment schedule at the bottom of the screenshot for an example. 6. 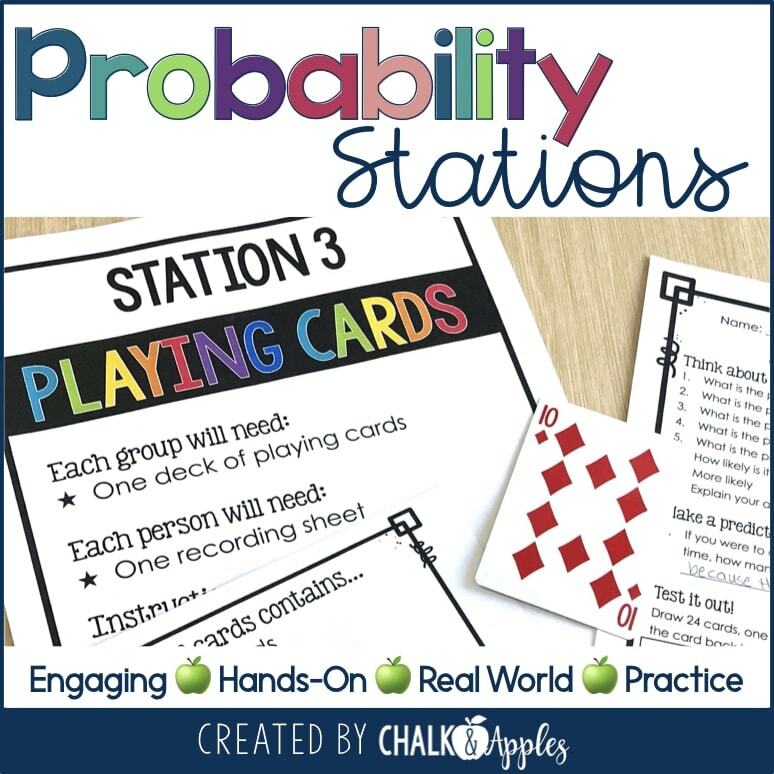 Share plans with teammates – My plans are shared with our SPED department so that they can easily see what’s going on in my class, and we can plan together. Nikki and I were teammates the past few years, and we would often share our plans with each other. They are easy to import in when one of us had planned a special unit. 7. 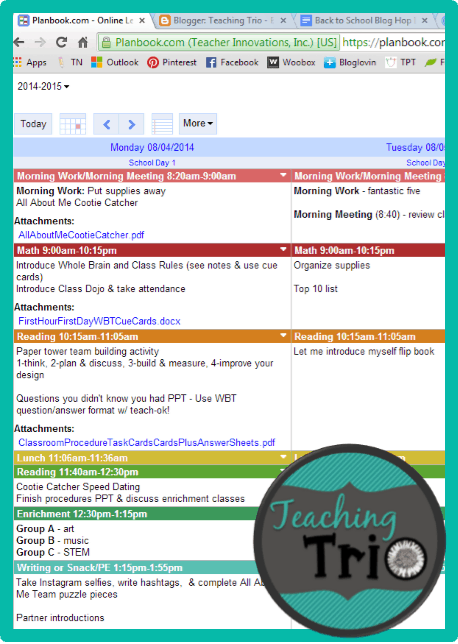 Create and send substitute plans easily – I added a lesson plan tab called “Sub Notes” where I type in all of the little things that a sub needs to know (how to turn on the morning news show, when students leave the room for support services, etc.). These things are now ready to go anytime I need a sub, and I don’t have to re-type them over and over or copy and paste. I simply log in to Planbook (usually from bed, if I’m sick enough not to go in), “fluff out” my normal plans so they will make sense to the sub, and send the link to one of my teammates. 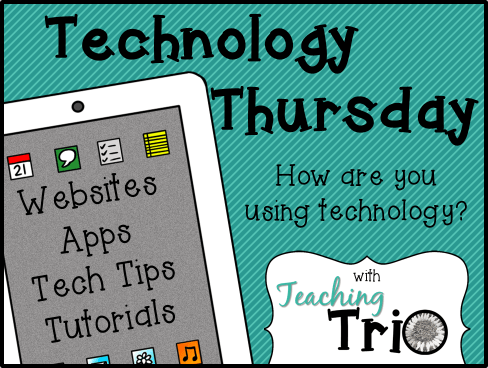 The sub then has access to any printables, presentations, videos, or web links that s/he will need that day. Couldn’t be easier! 8. Common Core Standards already loaded. If you don’t use Common Core (we don’t), they will add them for you. Juliet had our standards added in a snap. 9. Easy to follow tutorials for everything you could ever want to do! 10. Awesome customer service! They are constantly improving based on our feedback. This summer, they launched an iPhone app (iPad app was already available) and made several other changes based on teacher requests. Now for the nitty-gritty. Planbook is not free, but it’s cheap. $12 a year is less than most planners out there, for a lot more features. It’s 100% worth it in my opinion. If you aren’t sold yet, there’s a 30-day free trial, no credit card required. FYI – I am not recieving any compensation for this post, I just happen to love Planbook! I did a short introduction to Planbook last year at my school, so if you are interested in seeing more of the ins and outs, check out the Prezi from my presentation! 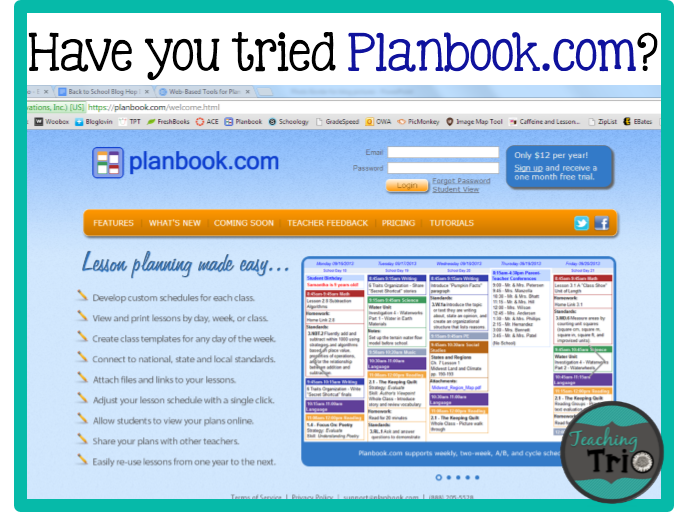 Have you tried Planbook? I’d love to know if you love it as much as we do! I love planbook.com too! 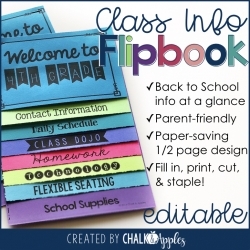 This year I splurged and purchased an Erin Condren teacher planner, but may still incorporate planbook.com (waiting on the planner to arrive). I'm your newest follower! 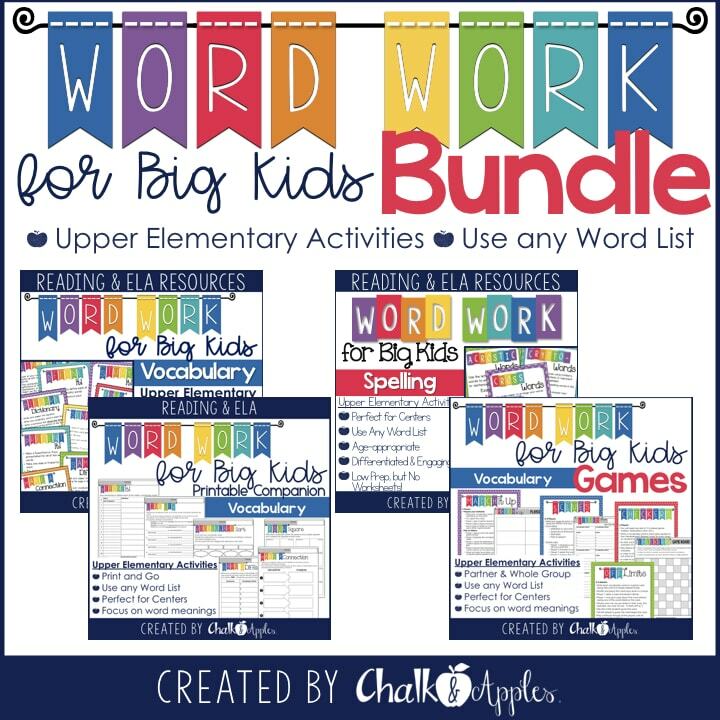 I found you on the back to school blog hop and purchased your Word Work for the upper grades! I can't wait to use it! 🙂 Happy Sunday! I made the switch a few weeks ago. I wish someone had told me about this program before. I am much more organized! 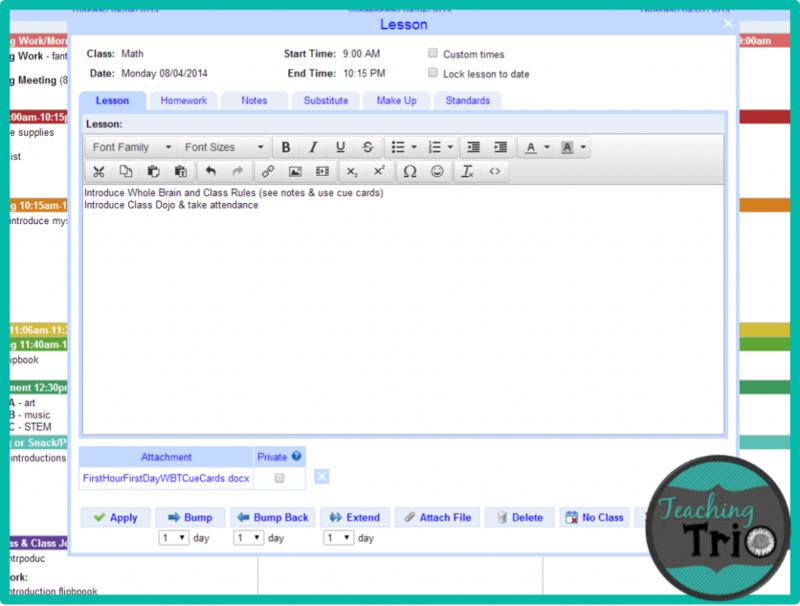 How do you add a tab into the lesson plan book? I want to add a sub section! Great idea! 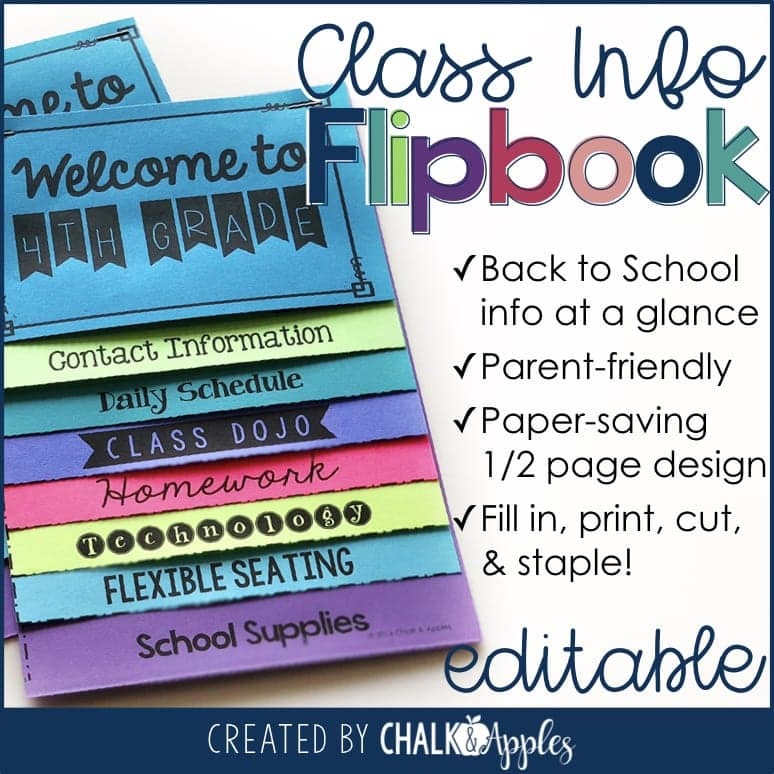 Would this be good for homeschool with multiple children/lesson plans.